Looking for some mouth-wateringly incredible foodie Instagram accounts to inspire your next meal? Well, you’ve made your way to the right side of the interwebs. 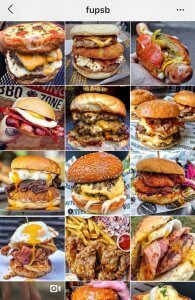 Today we’re taking you through a whopping thirteen foodie ‘gram accounts that we’re absolutely drooling over. Grab your knife, fork and spoon and get ready to feast your eyes on some of the best accounts we’ve ever seen floating around on Instagram land. These desserts and delights are absolute foodie heaven on the ‘gram! Scroll through to discover classic favorites with a twist and get inspired. Looking for some incredibly healthy and beautifully bright foodie Instagram photos? Well, this is the account for you! Scroll your way through a sea of green, orange, and yellow – we are absolutely blown away by how consistently themed this grid is. As the username says, this foodie account is dedicated to fuss-free, minimalist baked goods. Yum! There’s also a few other, more ‘dinner-worthy’ dishes that you can discover on this Instagram grid, but between you and me chocolate chip pancakes sound like the perfect dinner! 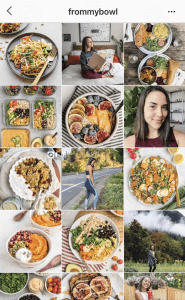 If you’re interested in plant-based living, this is the ideal foodie Instagram account for you. Lots of healthy food inspo and desserts to make your heart sing can be found right here. 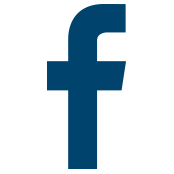 PSSST -> Want to know the secrets to create white borders on your posts? Here’s the trick! For a super aesthetically pleasing foodie Instagram account, we think this one takes the cake! Scroll on through and get all the inspiration you need for a week of grocery shopping. 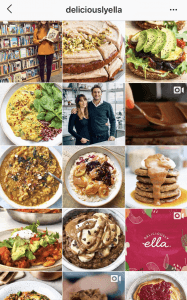 All the chocoholics in the room please stand up – it’s time to indulge in the foodie Instagram account we all love to scroll. Give me all the chocolate!!! Kath and Jade have some of the most incredible, high-quality foodie Instagram photos. It was only natural to add them to this list! Oh, and by the way, they’re goodies are wholesome and vegan, so if that is your jam…. chuck them a follow. PSSST-> Want to know how to successfully promote your Instagram account? Here are a few tips for ya! Another gem of the plant-based world, take a peek at this foodie Instagram account for some serious inspo. There’s lots of green goodness to feast your eyes on over here! If you’re a big-time avocado fan (who isn’t?!) you’re going to l-o-v-e this. For some feminine feasting, take a whiff of this pink and perfect Insta account. I could reaaaaally go for one of those doughnut-topped milkshakes right about now. Now it’s time for some more savoury wonders! Chippies and burgers? Mmm mmm mmm!!! Mozzarella sticks, burgers, loaded fries and fried goodness make up about 99.9% of this feed. PSSST -> Oh hey, here’s how you create the perfect Instagram content plan using these simple steps! 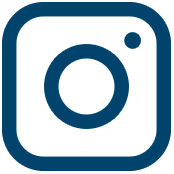 A short Instagram username with a looooong list of delicious things in their grid! Definitely worth a scroll or two. 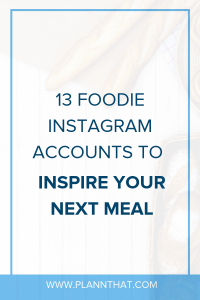 Holy macaroni that was a lot of foodie Instagram accounts to look at! We hope you really flipp’n enjoyed taking a scroll down drool-worthy lane with us.